Recycled Asphalt is made of asphalt pavement material removed from damaged surfaces in need of repair. It is then reprocessed so that up to 100% of the original asphalt material can be used and with our proven five step process for installation and repair your new recycled asphalt driveway can last up to 10 years or more without the need for serious repair. Unlike regular asphalt the recycled asphalt is already compact, making it more resistant and stable. A recycled asphalt driveway is recommended in areas of extreme weather conditions, such as long periods of rain, high temperatures, and heavy snowfall as it does not segregate or wash out like regular asphalt. 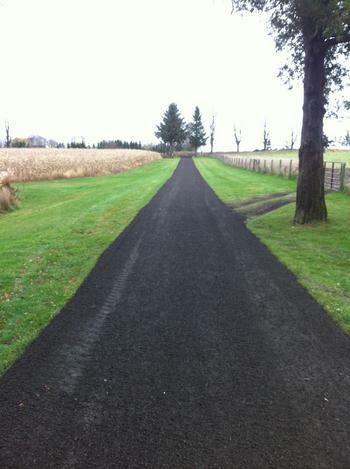 A recycled asphalt driveway is not only stronger, but cost effective and better for the environment. Gravel Driveway Services’ five step process for repairing and restoring gravel driveways with recycled asphalt ensures that your driveway will have a consistent surface with proper drainage and guaranteed results each and every time. The process may very slightly depending on terrain and grading requirements but will generally follow the five step process in it’s entirety. Our proven five step process clears, levels, installs, grades and compacts the new recycled asphalt on new or existing gravel driveways and will last up to 10 years or more after being compacted. We have an extensive coverage area throughout southern and central Ontario, including, but not limited to: Newmarket, Aurora, King City, Schomberg, Stouffville, Uxbridge, Georgina and Port Perry, New Tecumseth, Beeton, Tottenham, Lorreto, Alliston and Caledon, Orangeville, Barrie, Orillia, Keswick, Mono and Parry Sound, York Region, Toronto, the GTA and surrounding areas including Peel, Durham, Halton Regions and more. Contact Gravel Driveway Services and talk with one of our friendly representatives and find out how you can benefit from a recycled asphalt driveway today!